Over the years, it's become quite a tradition to gift your child/children's teacher/teachers and classroom assistants with a card and/or gifts when the school year is over in July. In recent news, the subject has caused quite a debate with 93% of teachers saying they've received gifts and some teachers saying it's becoming an unhealthy tradition. I am a parent who gifts, and who has always gifted, I like to say thank you to my childs teacher for looking after and supporting them throughout the last school year, for giving my child the support and encouragement that Spud needs at school as well as home. 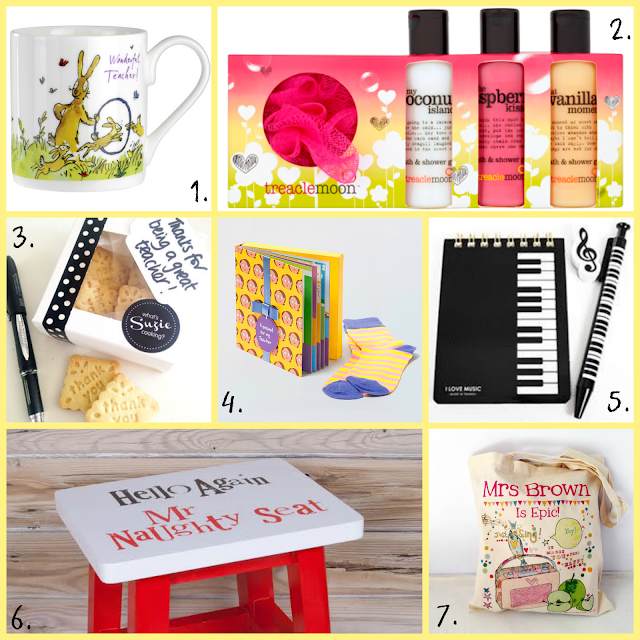 After looking for unique presents, not that there's anything wrong with a box of chocolates from the supermarket, I've decided to put my finds into a gift guide for all you parent's out there who do buy for their children/child's teacher/teachers! Illustrated by the great Quentin Blake this bone china mug is dishwasher and microwave safe, measuring 8.5cm high making it perfect for the teachers cup of tea or coffee! Available to buy from Present Indicative. Renowned for its scrumptious smells and fabulous formulations, which benchmark brands at nearly five times its price, treaclemoon is an independant UK brand available at Tesco. The featured gift set contains 3 x travel bath and shower gels and a body puff. Available to buy from Tesco and Tesco Direct. Wrapped and packaged in a smart white window box, completed with spotty tape and a plain white gift tag, these 16 hand made shortbread biscuits stamped with thank you are the perfect unique gift to gift a teacher at the end of the school year. Made from the talented Suzie from What's Suzie Cooking, why not gift your childs/childrens teacher/teachers with a unique and thoughtful gift? Available to buy from What's Suzie Cooking (NOTHS Store). This is by far my favourite product out of every product I've come across, I personally love books, and every teacher no matter the subject uses books at some point during their working week, so it also connects very well with any teacher. 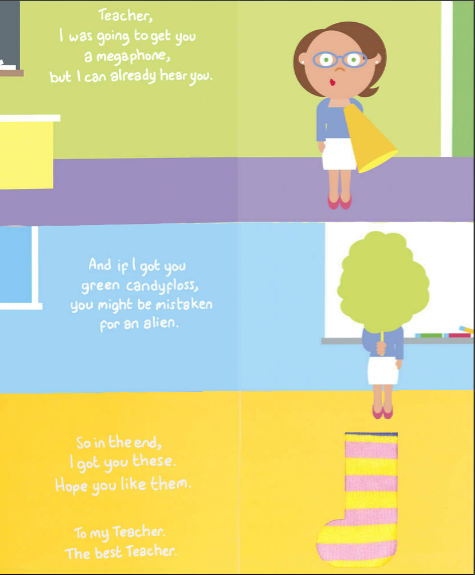 The book is a personalised gift from a child to their teacher that sells the magical story of the journey they took while finding the perfect present. It's written from the child's point of view and each scenario tells of the gift they might have got them but thought better. At the end the recipient is gifted a pair of socks! The gift tag on the front is personalised and you also get to choose from six different colours. There is many other designs available, including books for birthdays, new grandparents, new parents, siblings and much more! Make sure you check out Pooters for the full selection! Available to buy from Pooter. 5. Small Black Keyboard Stationery Kit - £2.99. This stationery kit couldn't be more perfect for a music teacher. The set includes a matching notepad and pencil with a piano design, treble clef, and a rubber to use in case the recipient hits the wrong note! An excellent buy at just under £3, this is the perfect gift for the music teacher! Available to buy from Music Room. This is one of the best quirky present's I've seen for teachers this year! With this present teachers can upgrade their naughty step to a naughty stool! Sturdy wood makes this a practical item, but would you like to see it in your child's/children's classroom? Available to buy from Really Good. Alice Palace are the designers behind this beautiful and unique personalised teacher bag that would make a wonderful present for not only teachers but teaching assistants too! These useful fold away bags come in six designs and can be a present for any teacher of any subject! Available to buy from Alice Palace. Teachers have so much to do throughout the day, so little accessories really do help them and their students along the way. This timetable cube is a great buy for teachers, class room assistants and students, it can even help language teachers teach their student numbers in French, German and Spanish! Available to buy from ZooBooKoo. This is a subscription service from The Personal Barber, however you can buy the box as a one off which would make the perfect present for any male teachers out there! The first box includes a double edged safety razor, blades, brush, shaving soap and step by step instructions on how to use the kit! Available to buy from The Personal Barber. 3. Sweet Strawberry Yankee Candle - Prices Vary Depending On Size. Yankee Candle has got to be the Heinz Ketchup of candles on the planet, surely! So why not gift your child/children's teacher or class room assistant with a Yankee Candle! Over half the population own a candle of some sort, and what's better, even if they don't light the candle, it's a great decoration for the classroom or at home! Available to buy from Yankee Candle. This brightly coloured mug is the perfect addition to the music teachers desk, or kitchen cupboard at home or in the staffroom, ready to be filled for a nice cup of tea or coffee! The cheerful mug is decorated with the words ''Love Music'' and has a musical note design on the inside and out! 5. Sweet Apple Yankee Candle - Prices Vary Depending On Size. As I mentioned with number 3, Yankee Candle has got to be the nations favourite candle makers! With so many scents to chose from, I reckon the sweet apple would go down well with any teacher this end of school year! I'm not quite sure of the tradition behind the apple being linked to teachers, but I'm about to go and find out! 6. Ashes 2015 Cotton Sun Hat - £15. As the Ashes action heats up, teachers can keep their heads cool with this quintessential cricket sunhat. Featuring an embroidered navy Ashes Urn with gold wreath, it's the perfect companion for a long hot summer of cricket action! Perfect for the sports teacher, and any other sports loving or Ashes fans teachers! Available to buy from Lords Online Shop. This pretty 0.5 litre flask with a pink lid and flamingo print is the ideal present for any teacher who's a fan of hot drinks, the item doesn't have to be a gift to stay in the class room, instead, a gift that is beside the teacher at home, in the car, on the bus/train, on a walk and so one! Available to buy from Rigby and Mac. 1. Apple Stud Earrings - £15. These earrings are the perfect set of earrings for any teacher, the mantra for the earrings is ''you teach from the heart, not from the book''. With a matching necklace available, individually or as a set, both pieces make the perfect present for any jewellery loving teacher. Available to buy from Fabulous. 2. Intu Gift Card - Prices Vary To Your Budget. Getting to see your child's teacher just a few times a week, and only in the class room or in the playground can make it near impossible to know their likes and dislikes! 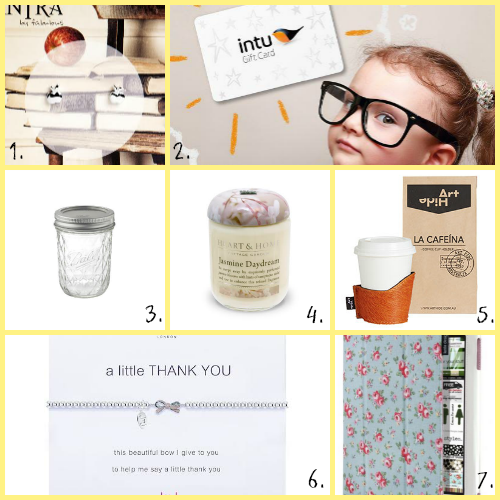 With a Intu gift card, you're gifting, but letting the teacher pick their own desired product! A win, win selection all around for both parties! The teacher receives something they could actually use and love as they've picked the product themselves, with the thanks of your gifted gift card! Available to buy from Intu. 3. 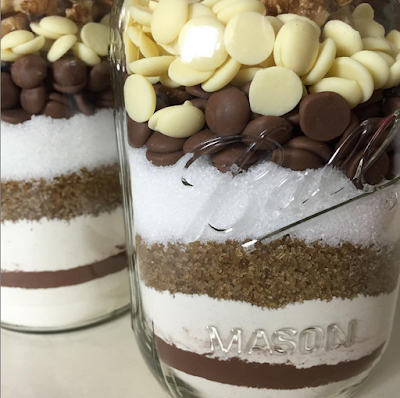 Ball Mason Jar - Prices Vary On Size and Quantity. 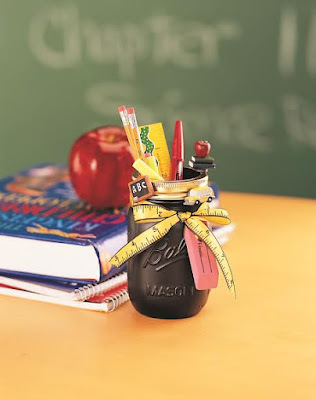 You may be looking at the image above of number three, and wondering why anyone would gift a teacher a plain jar? Well, thats where you and your child can become creative, and play around with the jar to create some amazing and unique gift ideas! Using some paint, and some ribbon and little decorations, you can make a personalised stationery pot for your child's teacher, or even better, supervise your child and let them get creative themselves! Another one for both you and your children to get involved with, with the idea coming from blogger Le Coin De Mel, measure out cake/brownie/muffin ingredients and fill the jar, then simply present to your child's/children's teacher/teachers and/or classroom assistants! With such a special touch, maybe even the head teacher could be gifted one! Available to buy from Ball. This Heart and Home Cottage Garden candle is just one of many fragrances sold by Heart and Home. Gift a candle individually, or buy a mixture and you can make up a little handmade/homemade hamper with love from your child/children and yourself. Available to buy from Heart & Home. Perfect for all teachers and class room assistants, this cup holder can be used for both hot and cold drinks, and is a gift that doesn't have to be kept in the classroom! It won't die like flowers, and it won't be eaten like chocolate, instead it could possibly last forever! Available to buy from Fifi De Lyon. From the Joma Collection at Narborough Hall, this bracelet is the perfect way to say thank you to your child's/childrens teacher or even the classroom assistant for helping them throughout the school year. Presented on a simple white Joma Jewellery card, the quote reads ''this silver bow I give to you, to help me say a little thank you''. Available to buy from Narborough Hall. 7. Tablet Case - Prices Vary Depending On Model and Design. What person, or at least teacher doesn't have a tablet of some sort these days? With technology advancing by the minute, its very rare to find the old fashioned pen and paper being used nowadays, so why not gift the teacher you're buying for a tablet case? With dozens of designs to choose from, you'll be spoilt for choice! Available to buy from Lente Designs. 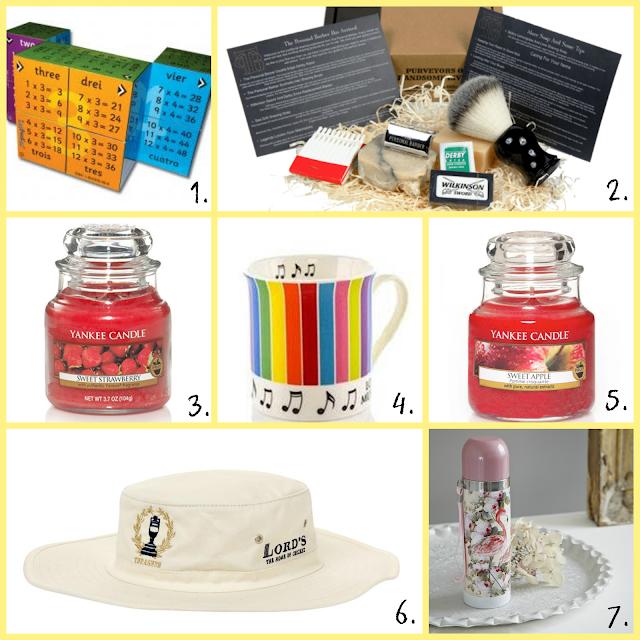 There we have it, the 2015 Teachers Gifts Gift Guide, I hope you've enjoyed browsing through the guide with all the unique and special products I've found! Although the thought counts, and there isn't anything wrong with a box of chocolates, sometimes gifting a more personal and unique present is a blessing!